The European Commission has sharply cut its 2015 growth forecast for Greece to 0.5 percent, pointing to political uncertainty in Athens. Greece is struggling to agree a package of economic reforms with the Troika of creditors to unlock bailout funds. Greece's economy suffered an alarming slump in the first three months of 2015, according to the EU Commission’s spring forecast published on Tuesday. It is a huge reduction from the Commission’s earlier projection of 2.5 percent just three months ago. The Commission anticipates Greek growth to accelerate to 2.9 percent in 2016 while earlier it predicted 3.6 percent growth. Unemployment, which was forecast to decline to 22 percent in 2016, will now come down to only 23.2 percent. Prices fell by 1.4 percent in 2014 and inflation is expected to remain below zero in 2015, due to weak domestic demand, the report says. The real GDP of Greece grew for the first time last year since 2007, expanding by 0.8 percent. However, high political uncertainty and tighter financing conditions are holding back the recovery and weighing on public finances, the EU Commission explained. The uncertainty has grown since the Syriza party won the general election in January with the promise to bring an end to austerity policies. "In light of the persistent uncertainty, a downward revision has been unavoidable for Greece,” Pierre Moscovici, the EU's Economic Affairs Commissioner, told a news conference. Greece’s sovereign debt is expected to jump to an unprecedented 180.2 percent of GDP this year, according to the report. The commission predicted a decline to 170.2 percent earlier in February. Meanwhile, Greece is trying to find a compromise with its international creditors. On Monday, Athens pledged to pay off its debts to all creditors, including the IMF. Last week, Greece claimed an agreement with the Troika could be reached within a few days, despite the differences between the parties over the measures Greece should take to receive the money from the bailout fund. The creditors demand reforms, including the reform of the labor market, and the pension and the tax systems that the government doesn’t want to carry out. Greece is expected to pay off €750 million to the IMF by May 12. Prime Minister Alexis Tsipras said earlier in April, the country plans to reach a preliminary agreement on a bailout deal with the EU by May 9. 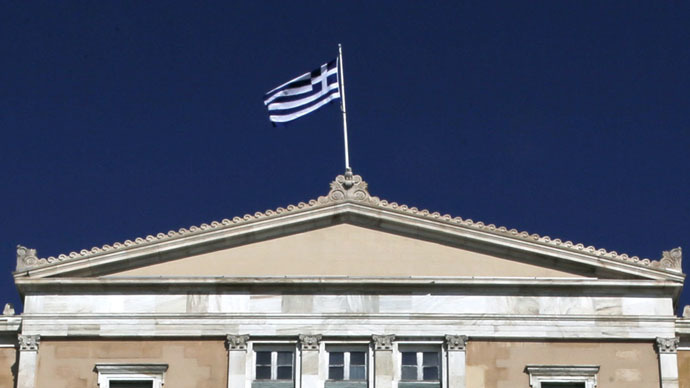 The deal will then provide cash-strapped Athens with funds before its next IMF payment is due.